The world of outsourced software development is filled with horror stories from clients. It’s common to hear of price gouging, language difficulties, and challenges managing employees across timezones, just to name a few. We’ve all heard them. For the most part outsourcing challenges are overblown. At SourceSeek, we know that when good clients and good teams are well-matched engagements are almost always successful. But still, we were curious to learn the truth about what challenges really do occur in the outsourced software industry. 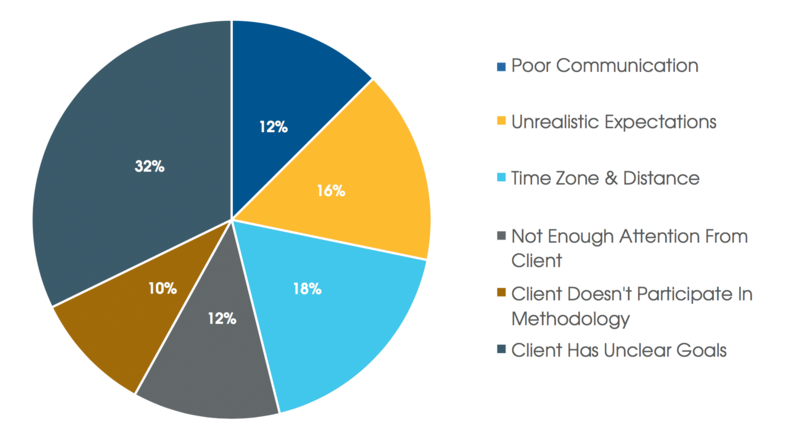 ‘Client Has Unclear Goals’ is by far the most common outsourcing challenge vendors face when working with offshore clients. This is not surprising given that unclear stakeholder expectations is a common problem with offshore and in-house software projects alike. It does, however, bring into question the long-standing theory that offshore development frequently fails due communication or the skills of the vendor. Only 18% of vendors believe that ‘Time Zone & Distance’ is the most significant hurdle in working with offshore teams, indicating that 82% of vendors believe the biggest outsourcing challenge is in the clients’ own project management skills. Weighing the results confirms our original findings – ‘ Client Has Unclear Goals’ remains the most common outsourcing challenge. When weighting responses ‘Unrealistic Expectations’ and ‘Not Enough Attention From Client’ rank as larger challenges than ‘Time Zone & Distance’. Somewhat surprisingly, ‘Poor Communication’ ranks as the least significant challenge in both the weighted and unweighted analyses. So all told, from the perspective of development teams, offshore projects are not much different from in-house or agency projects. If the client (or internal stakeholder) has unclear goals, unrealistic expectations, or is inattentive, the project is going to suffer. This is pretty straight forward. And as for the the more traditional outsourcing challenges — ‘Poor Communication’ and ‘Time Zones & Distance’? Those rank dead last — showing that outsourcing really is no different from any other software development project. To download the full results from our Global Software Services Report for free, click here . It is full of useful insights into the outsourcing industry such as pricing, language specialization, and geographical trends.